Within the first half hour of The White Ribbon I began forming a theory in my mind. 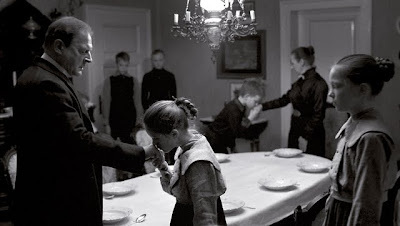 Viewers of Michael Haneke's work are not passive ones but active participants. And although his movies resist and defy the logical confines of giving us an actual solution for the puzzles he presents, we can't help but watch his work with a sharper eye like the schoolteacher in the film who's narrating the events that occur decades later and simultaneously appears in the movie as a young man who's equally as mystified as we are. For, just like us taking in Haneke's twenty-four frames per second and trying to evaluate everything from a certain juxtaposition, camera angle or implied thought, the teacher portrayed by Christian Friedel is also trying to take charge, guide and understand the children in his care by offering them education and seeing what he can learn from them as well. Once I began noticing that my mind was moving steadily into a whodunnit mode I stopped the film, eager to experience it with another fresh pair of eyes. But before doing so, I decided first to invite my friend to revisit Haneke's earlier superlative confounding mystery that also occurs under an air of suspicion, malevolence, and terror in the form of 2005's Cache, which seemed to be the ideal way to prepare her for the type of cinema conceived by Haneke – a director who almost invents his own new language for the medium of film which none of us have quite been able to translate yet. 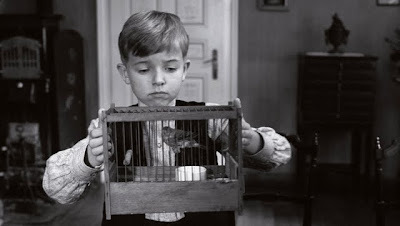 There are definitely flickers of David Lynch, Stanley Kubrick, and Lars von Trier that seem to echo throughout his work but instead of paying homage to other auteurs, Haneke's films are distinctly his own and The White Ribbon which received the Palme D'or from the Cannes Film Festival, the Golden Globe for Best Foreign Language Films and two Academy Award nominations is no exception. 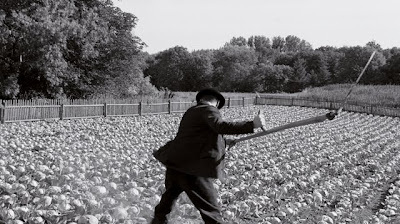 Many in fact consider the stark, deceptively simplistic black and white work to be his greatest masterpiece thus far. 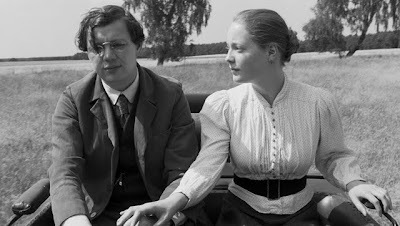 And although I still tend to gravitate more towards Cache overall as there are some stretches that could have used a more careful edit in the 144 minute work, I'm inclined to agree that as far as Haneke's films go, it's decidedly The White Ribbon which has the most to say. Likewise, Ribbon will hold up the longest in time as despite its pre World War I setting of a rural village in Germany, it could've just as easily taken place in any other country in any other decade. Eerily haunting even when taking into consideration that the film is shot in the most straightforward manner, The White Ribbon centers on a series of evil events that escalate in seriousness, which throws the rigorously regimented Protestant black and white community out of order as chaos enters the previously well-ordered lives of the residents. Narrated by the schoolteacher who warns us right from the start that he's using secondhand information in expressing to us what has transpired, which has been told from one person to the next, as the movie opens, we're immediately thrust into the action as the first incident occurs and the village doctor is thrown from his horse after it rides headfirst into a tightly wound, thin wire that has been fastened in between two trees. More horrors occur, some which seem as though they could have been purely accidental and others that were undoubtedly carried out by one or more members of the community as children are “punished” in ways far more severe than we find in homes that are wound tighter than the tripwire where an adolescent boy's hands are tied at night to prevent him from lust, some are struck behind closed doors, and one we gather is being molested. 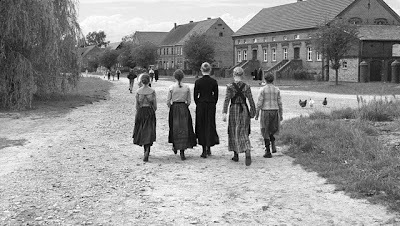 When you do the math and see the seemingly innocent faces of the children, suddenly the teacher's opening narration that this story explains what has happened to his “country,” seems to imply the evolution of Nazism and the roots of any radical, fundamentalist regime but The White Ribbon works on an even larger scale given the many questions it raises throughout. Does violence breed violence? How much freedom are we willing to surrender if we feel that more involvement from authority will stop such violence? And if it exists in nature, will violence ever stop? What are the dangers of group think? Is this vigilantism, revenge, ferreting out the weak or merely settling scores? Is the world simply prone to listening to those who scream the loudest with violent demonstration? How much do we really know about our community? Do we care and if so, what are we willing to do about it? What can we live with and what can't be tolerated under any circumstances? Why? It's the type of movie that's bound to frustrate, infuriate and provoke all kinds of theoretical discussion or just simply a strong reaction if viewers are patient enough both to sift through all of the various implications and situations brought to light as well as the rather deliberate pacing of the work. While the cinematography has garnered raves for its beautiful usage of light and shadow which is fascinating for a film that was actually shot in color and then drained out to transform into the two tone black and white look with digital sharpening of certain details, on Blu-ray the transfer appears slightly grainier than one would expect with a tendency towards too much darkness at times in scenes where it was hard to discern a set from a person. When you couple this with the dubious decision to go against traditional yellow subtitles in favor of very tiny white font that makes you squint throughout the work irregardless of the size of your television screen or when you visited an optometrist, the work can be a bit rough going. And it's doubly difficult for those unwilling to meet some of these visual imperfections halfway as you're sure to want to back up certain scenes for clarification purposes and/or to try and see if you can make out the words barely present at the bottom of the screen. 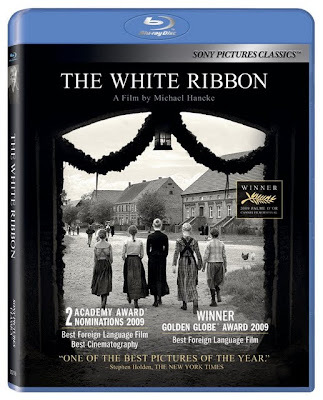 Yet despite this flaw, Haneke's Ribbon is tremendously affecting, giving you far more to ruminate over than Cache -- both to viewer's intellectual delight and natural dismay for its refusal to play by any storytelling rules. And in addition to just being impressive simply from an artistic point-of-view, it's especially admirable since Ribbon, which was originally conceived as an idea twenty years ago and nearly made as a three-part miniseries, somehow feels timelier than a majority of other films releasing today, despite the fact that it's set nearly a hundred years ago.